On the great dessert hunt this very day. My good friend, Owen, is a great cook who loves good food as much as I do. When he heard I was starting a section on my blog called ANGELFOOD, where I want to share recipes, delicious dishes and favorite restaurants, this was his gift of Autumn ambrosia to all of us. Way to start off the ANGELFOOD on eflorence. Dig in everyone! 8. Reduce heat and finish with milk or cream; DO NOT BOIL. 11. Serve with warm crusty bread. This hearty soup satisfies with its texture, taste and aroma, and is very quick and relatively inexpensive to make. It is chock-full of vitamin A and is a good source of fiber. *In place of honey, SPLENDA or sugar can be used (or EQUAL™ after soup has finished cooking; cooking will destroy the proteins that make EQUAL™ sweet). 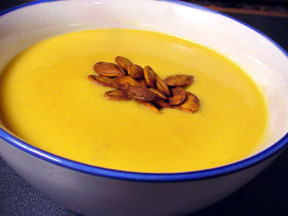 NOTE: Persons with a potassium restriction should avoid this soup, as the pumpkin and optional potato are loaded with potassium.